With this 16th installment of our walkthrough of Welcome To Skull Tower, we start delving into the background information about the Arduin setting, previously mostly hinted at obliquely through small fragments of flavor text surrounding the mechanics. Now we get the full-on details of the setting, beginning with a broad, high-level overview that provides a meaningful contextual framework for what is to follow, and then progressively more detailed information, presented in a clear, logical manner that builds on what has gone before in a way that is… (snicker)… a way that… (hee hee)… a way… aw, to hell with it. It’s the same wonderful, glorious, chaotic, insane mess of idea after idea after idea coming at you pell-mell without surcease, and you either leap into the onrushing tide of creativity and ride it, screaming “Wa hooo!” as you surf into a skyscraper (props to anyone catching that reference), or you drown. Last week, as you recall, Dr. Smith and Will were fixing the planetary astroscope, when a cosmic storm… no, wait. Last week, as you recall, we had a picture of a Hobbit barbarian. (Yes, really. Go to Part XV. I’ll wait. Back? Good.) But, little did you know that that picture illustrated “Comments On Inns And Roadhouses.” What does a Hobbit barbarian have to do with inns and roadhouses? Really, you should know better than to ask. And then we go into the seasons and the length of the day. We get a half-page of general comments on inns, followed by a barbarian Hobbit, and then… the length of the day. There is, in fact, a long section listing an assortment of inns ,taverns, etc., but it’s many pages away from the introductory text. Welcome to the 1970s, folks! Days in Arduin are exactly 25 hours long, with ten hours of night and ten hours of darkness, and 2.5 hours of twilight and dawn. There is no “axial tilt or rotational wobble”. Weeks are six days long, there are 15 months in a year, and there’s a three day “Endyear” period. Each season is precisely 125 days, which sort of leaves the three day “endyear” out of the equation. Taken literally, it would mean the Arduin calendar shifts, relative to the seasons, at a rate of three days a year, so every forty years or so, an entire season is ‘out of sync’, so fall would be where summer is, etc. Presumably, these are symbolic/mystical, like similar cycles in Earth mythology and astrology. It’s a cool idea, especially for setting up plot macguffins, like a ritual which can only be completed in the year of the Scorpion, or a race to get a royal marriage completed during the year of the Sun. I would gather that wars happen in years other than Draconus, and Druids hold festivals all the time, but this kind of thing creates some flavor, and helps invoke a sense of reality in the world — there’s a past to it, with traditions, rituals, and superstitions that aren’t necessarily hooked into what the PCs are doing today. The sparse descriptions — each barely a sentence of vague implications — sets the creative mind a-wandering, and inspires the young worldbuilder (i.e., me) to include such things. Who does not want a campaign that begins with “It was the fourth day of the fifth month of the Grey Year, and…”? Weather in Arduin (the nation; the planet is called Karse, though I’m not sure if this is ever mentioned in this book) varies quite a bit over the course of a year — with no axial tilt, the world must have a much more elliptical orbit than Earth. It resembles, we are told, “Bavarian Germany”, with more insect men and fewer pretzels. Probably. Somewhere in Dave’s copious and possibly lost notes, there’s got to be a page or two on Arduinian pretzels. If we ever get to the post-trilogy books, you’ll understand why I think that. Because it would hardly be an old-school supplement if we didn’t interrupt the flavor text with some random information that has no mechanical support, would it? There’s a quick discussion of the dangers of wind and cold, and then a table that correlates wind speed to effective temperature assuming a base of 20 degrees Fahrenheit, and.. erm… that’s it. Nothing to translate this information into game rules.. just a half page of discussion about wind and cold. Why? Maybe it’s something Dave was researching that ended up on the same page as the other topics and got pasted into the book. Maybe he needed a place to stick it, and it ended up here. Who can tell? 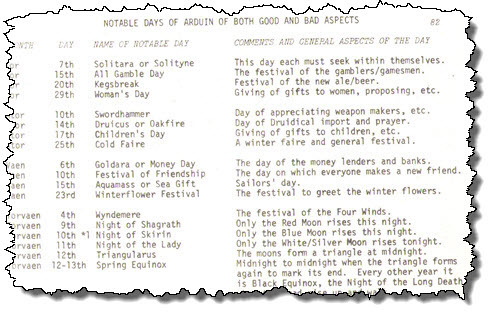 The next two pages are a listing of the holidays of Arduin, following the pattern of “name and really brief description” we’ve seen elsewhere. Once more — very inspirational. Few worldbuilders, at least in the early days, ever thought about things like this. And the list isn’t just “Fake Easter, Fake Christmas, Fake Fourth Of July”, either. Here. Let me show you a part of it. My Holidays. Let Me Show You Them. There’s another full page in this fashion. I think these are specifically Arduinian holidays, not global ones. Even given the limited descriptive text, it’s easy to imagine the various celebrations, rituals, and rites which might accompany each day, from desperate lovers buying flowers at the last minute for Woman’s Day, to parades honoring the town’s naval veterans on Aquamass. Ancient rituals might only be performed on the Night of Shagrath, and a child born at midnight on Triangularus may have a destiny both great and terrible. Etc. The real value of this list, and the many similar in the trilogy, isn’t in the information it presents, but in the very idea of it — it’s the kind of thing you instantly want to replicate for your own worlds, something you didn’t realize you were missing until now. Next, guilds. 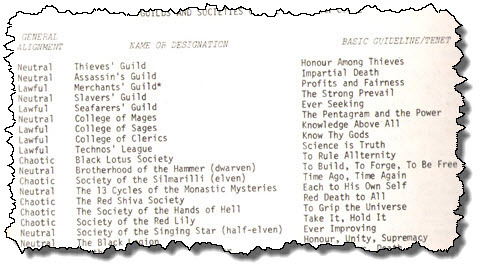 Or, technically, “Guilds And Societies Of The Arduin Cycle”. 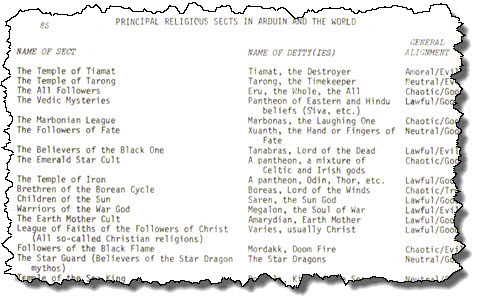 A lot of F/SF literature of the time was granted the slightly-pompous title of “Cycle”, to tie it back to older myths… you’d hear “The Elric Cycle” or “The Cthulhu Cycle” on occasion. I think we’re done with that now, with “series”, “universe”, or even “mythos” taking over that role. In any event, why Dave chose a literary term is beyond me; it seems a bit aspirational. No Guilds Called **!!AzzK1kerz!!**? How Odd! Nowadays, each of these would have a 64 page supplement complete with three Prestige Classes, twelve NPCs, a detailed map of the HQ, and plenty of plot hooks. Back then? You got a name and some words, bub, and you liked it. That’s enough for now, methinks. At this point, we’re looking at either two or three more articles in Skull Tower before we move on to the Runes Of Doom.